The extent to which the return of major and minor elements to the dissolved phase in the deep ocean (termed remineralization) is decoupled plays a major role in setting patterns of nutrient limitation in the global ocean. It is well established that major elements such as phosphorus, silicon, and carbon are released at different rates from sinking particles, with major implications for nutrient recycling. Is this also the case for trace metals? A recent publication by Boyd et al. in Nature Geoscience provides new insights into the biotic and abiotic processes that drive remineralization of metals in the ocean. 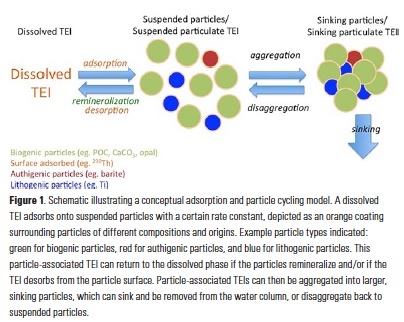 Particle composition changes rapidly with depth with both physical (disaggregation) and biogeochemical (grazing; desorption) processes leading to a marked decrease in the total surface area of the particle population. The proportion of lithogenic metals in sinking particles also appears to increase with depth, as the biogenic metals may be more labile and hence more readily removed. Findings from GEOTRACES process studies revealed that release rates for trace elements such as iron, nickel, and zinc vary from each other. Microbes play a key role in determining the turnover rates for nutrients and trace elements. 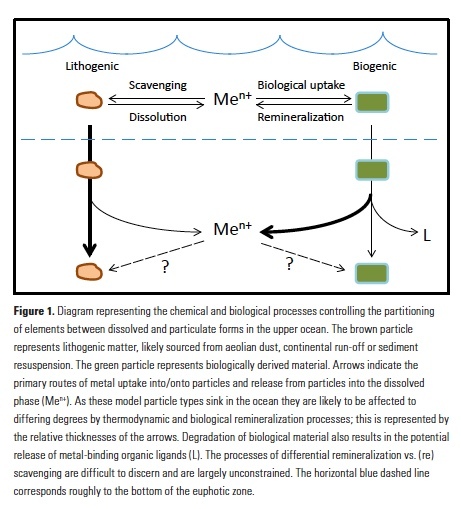 Decoupling of trace metal recycling in the surface ocean and below may result from their preferential removal by microbes to satisfy their nutritional requirements. In addition, the chemistry operating on particle surfaces plays a pivotal role in determining the specific fates of each trace metal. Teasing apart these factors will take time, as there is a complex interplay between chemical and biological processes. Improving our understanding is crucial, as these processes are not currently well represented by state-of-the-art ocean biogeochemical models. Figure caption: Rapid changes in the characteristics of sinking particles over the upper 200 m as evidenced by: a) differential release of trace metals from sinking diatoms; b) changes in proportion of lithogenic versus biogenic materials; and c) ten-fold decrease in total particle surface area. 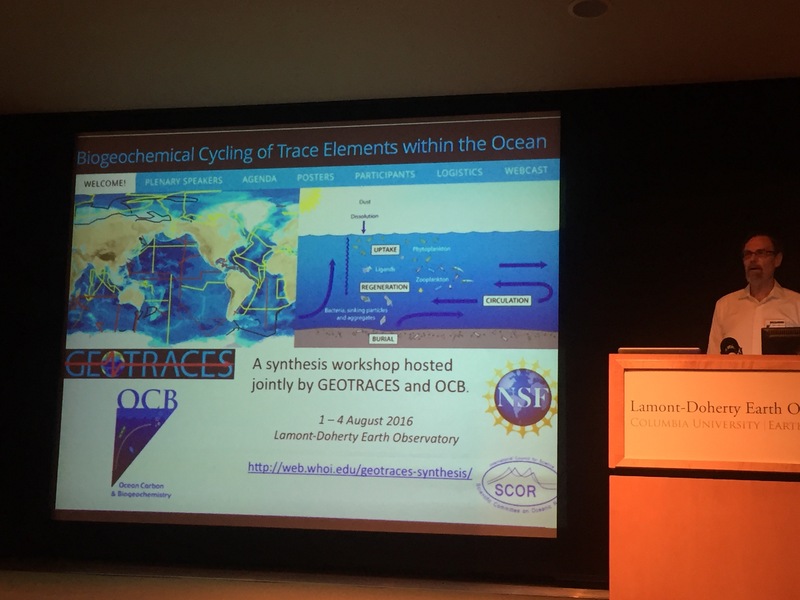 Over 100 scientists from 12 nations met at the Lamont-Doherty Earth Observatory in Palisades New York, USA, on 1 – 4 August 2016 for a synthesis workshop on the Biogeochemical Cycling of Trace Elements within the Ocean. The workshop focused on setting priorities for utilizing GEOTRACES trace element and isotope (TEI) data sets to advance scientific objectives at the interface of marine biogeochemistry and ecology, and was jointly sponsored by the GEOTRACES and OCB Programs. Following a series of plenary talks designed to stimulate discussion on these topics, participants spent the remainder of the workshop in smaller group discussions to identify knowledge gaps and develop ideas for synthesis activities and products that combine GEOTRACES TEI data with other biogeochemical and biological data sets. • developing synthesis paper on TEIs in nepheloid layers. To learn more about and/or contribute to these activities, please contact Heather Benway (OCB) or Bob Anderson (LDEO). For more information, visit the workshop website or view the plenary presentations. We rely on global ocean models to predict how climate change might affect the evolution of ocean productivity, acidification, and deoxygenation (1). Such platforms are also used to test hypotheses regarding the controls on ocean biogeochemical cycling and to understand past change (both on historical and geologic timescales). 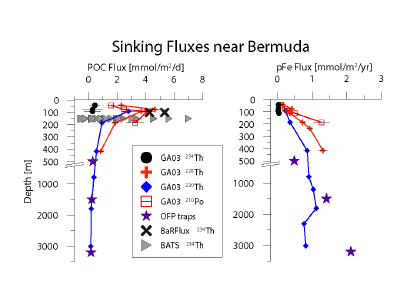 Ocean biogeochemistry models began with relatively simple formulations of a carbon export flux that involved restoring to observed phosphate distributions, but have more recently evolved into complex multi-element representations of the ocean. In line with our understanding that the trace micronutrient iron (Fe) limits phytoplankton productivity over large areas of the world ocean (2), most global models that aim to project future change also explicitly represent the Fe cycle. Datasets regarding the major limiting nutrients (nitrate, phosphate, and silicate) have been available as gridded ‘climatologies’ since the early 1990s (3). This has greatly facilitated the development and evaluation of modelled distributions over the past two decades. However, over this period there has been little comprehensive evaluation of how different models represent the ocean Fe cycle. 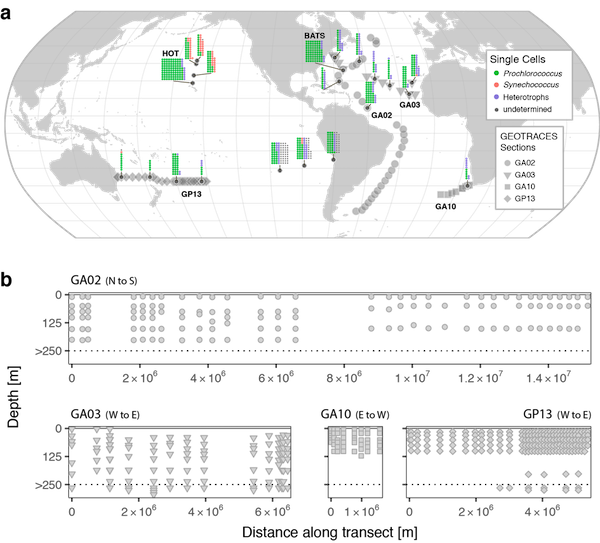 Over recent years, there has been a marked increase in the availability of iron measurements in the ocean (4), largely driven by the international GEOTRACES effort to conduct full depth, basin-scale surveys. This led us to initiate the first-ever attempt to critically compare a range of global ocean iron models against the largest global datasets, as well as against the newly emerging ocean section data (5). The Fe Model Intercomparison Project (FeMIP) sought to be as inclusive as possible in this first step and therefore did not seek to standardize the underlying ocean circulation or external inputs. Instead, we simply asked each of the thirteen models to provide their best representation of dissolved iron in three dimensions at monthly resolution. 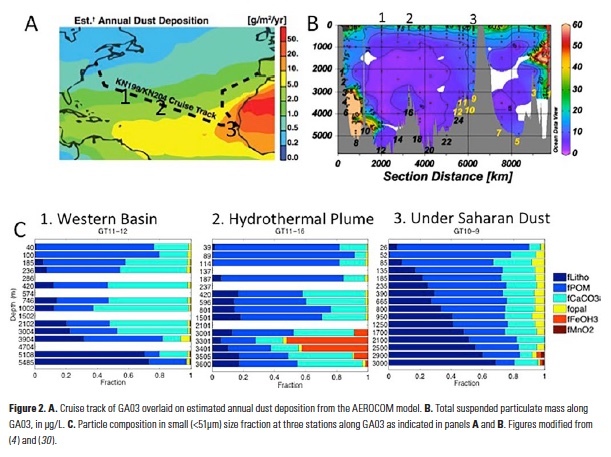 We then compared these models against each other, a global iron database of over 20,000 observations and against five unique basin-scale sections from the GEOTRACES intermediate data product 2014 (IDP2014) (6). Firstly, it is apparent that even when the underlying iron cycles of the different models are evaluated, a substantial degree of inter-model discord exists. The total iron input varies from around 2 to 200 Gmol yr-1 across the thirteen models (Fig. 1a). Even for ‘well known’ sources like atmospheric deposition, the inter-model variability is around an order of magnitude. On the other hand, the average concentrations of dissolved Fe between the models is much less variable and ranges from 0.35 to 0.81 nmol L-1 (Fig. 1b), or an average of 0.58±0.14 nmol L-1. This apparent constancy reflects an initial view of the ocean Fe cycle in which interior Fe concentrations were held at a quasi-constant value of 0.6 nmol L-1 assuming a constant concentration of Fe-binding ligands (7). Thus the FeMIP models are balancing widely varying Fe input fluxes against relatively constant overall Fe concentrations by tuning the Fe scavenging rate, which is a crucial but poorly known parameter. This results in residence times for Fe that range from <5 to >500 years across the FeMIP models (Fig 1c). This difference is important, as it represents substantial inter-model deviation concerning the timescales over which the different models respond to a perturbation in Fe supply. When compared statistically against the global dataset, similar levels of variability arise. Some models display correlation coefficients of >0.5, whereas others are slightly anti-correlated. 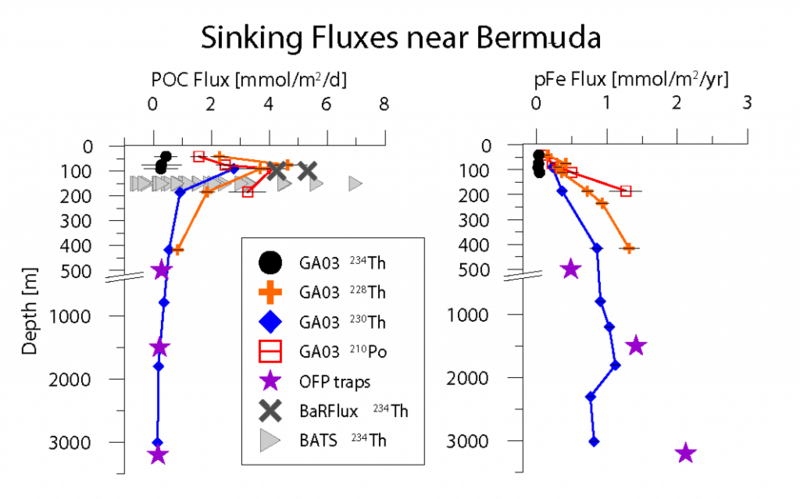 When the FeMIP models are compared against the five GEOTRACES sections, it becomes apparent that those models that represent the newly emerging features of the iron cycle perform much better. For instance, having Fe scavenging rates that vary in space and time, including variable Fe:carbon (C) stoichiometry, multiple Fe sources, and representing ligand concentrations in a dynamic manner, all act to improve the representation of different observed features in the models. Importantly, the IDP2014 provided the opportunity to demonstrate that the issues at hand were specific to Fe, since the models could represent the observed distributions of major nutrients with a much greater degree of skill (5). The next stage of FeMIP will be a deeper comparison of the processes themselves. Of particular interest is whether GEOTRACES datasets can provide broader assessments of the rates of Fe scavenging – e.g., using other particle-reactive, non-biological tracers such as thorium (8, 9). Equally, the emerging database of GEOTRACES process studies provides an important opportunity to appraise the way different models represent biological iron cycling and in particular, the often-observed importance of recycled and remineralized sources of Fe (10, 11). Finally, the new GEOTRACES intermediate data product 2017 will also facilitate further evaluation of models, providing new section data from the Atlantic, Pacific and Arctic Oceans. 1. L. Bopp et al., Biogeosci. 10(10), 6225-6245, doi:10.5194/bg-10-6225-2013 (2013). 2. C. M. Moore et al., Nature Geosci., doi:10.1038/ngeo1765 (2013). 3. S. Levitus et al., Prog. Oceanogr. 31(3), 245-273, doi:10.1016/0079-6611(93)90003-v (1993). 4. A. Tagliabue et al., Biogeosci. 9(6), 2333-2349, doi:10.5194/bg-9-2333-2012 (2012). 5. A. Tagliabue, A. et al., Glob. Biogeochem. Cycles, doi:10.1002/2015gb005289 (2016). 6. E. Mawji et al., Marine Chem. 177, 1-8. doi:10.1016/j. marchem.2015.04.005 (2015). 7. K. S. Johnson, R. M. Gordon, K. H. Coale, Marine Chem. 57(3-4), 137-161, doi:10.1016/s0304-4203(97)00043-1 (1997). 8. C. T. Hayes et al., Geochim. Cosmochim. Acta 169, 1-16, doi:10.1016/j.gca.2015.07.019 (2015). 9. N. Rogan et al., Geophys. Res. Lett. 43(6), 2732-2740. doi:10.1002/2016gl067905 (2016). 10. P. W. Boyd et al., Glob. Biogeochem. Cycles 29(7), 1028-1043, doi:10.1002/2014gb005014 (2015). 11. R. F. Strzepek et al., Glob. Biogeochem. Cycles 19(4), GB4S26, doi:10.1029/2005gb002490 (2005). 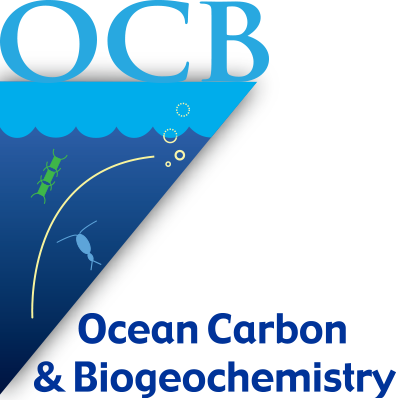 This summer OCB and GEOTRACES are co-sponsoring a synthesis workshop on the biogeochemical cycling of trace elements in the ocean. The overall goal of the workshop is to bring together expertise from across the field of oceanography to take advantage of the growing datasets of trace elements in the ocean and explore biological-chemical-physical underpinnings of trace element cycling within the ocean. One of the three main themes that will be addressed at the workshop is “biological uptake and trace element bioavailability.” Part of this theme will include a discussion of how molecular markers have been used to address questions of trace element bioavailability in the past and the exciting future for continued efforts in this area given the growing molecular toolkit. 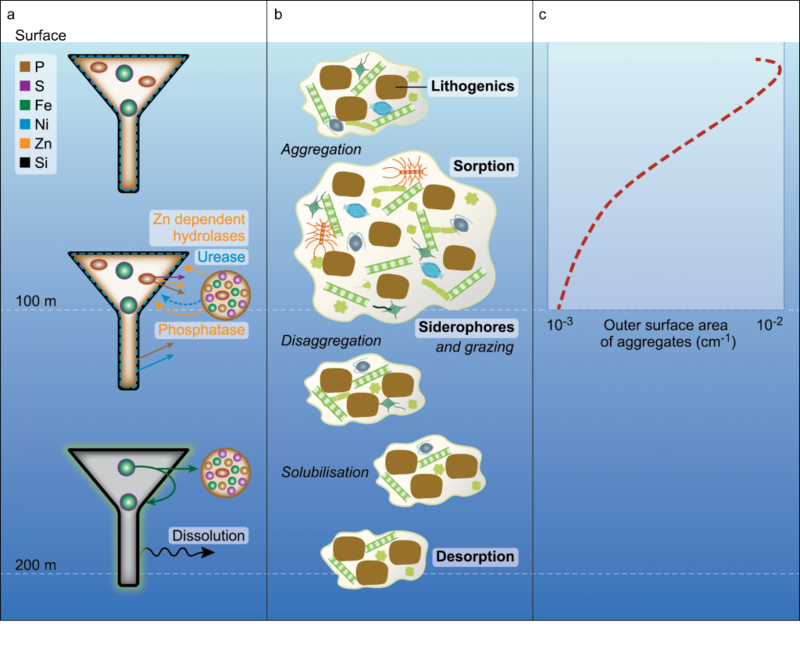 As a starting point to open the door to this broad discussion topic, let us turn our attention to how molecular methods have been used to evaluate iron (Fe) bioavailability to certain phytoplankton groups. Marine phytoplankton play a key role in the global carbon cycle by performing a significant fraction of global primary production (1). Since John Martin’s groundbreaking work introduced the concept that Fe is a limiting nutrient for phytoplankton growth (2), numerous studies have shown that insufficient Fe limits primary productivity in the major high-nitrate, low-chlorophyll (HNLC) regions of the ocean, and that Fe availability can regulate phytoplankton processes in many other oceanic settings (3, 4). 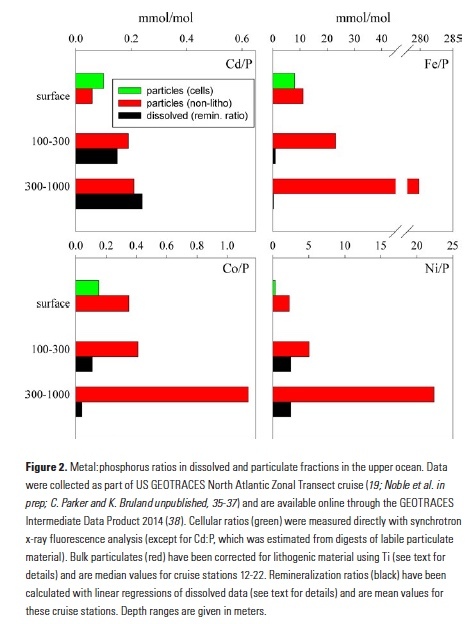 Fe is a critical micronutrient required by phytoplankton for a Exploring molecular methods for assessing trace element bioavailability in phytoplankton Dreux Chappell (Old Dominion Univ.) multitude of cellular tasks, including electron transfer in photosynthesis and respiration, as well as macronutrient acquisition and assimilation (5). Studies of Fe limitation in marine environments beyond the traditional HNLC regions suggest that Fe limitation may be driven not simply by low Fe concentrations, but a combination of low Fe bioavailability coupled with high macronutrient supply (e.g., 6, 7). 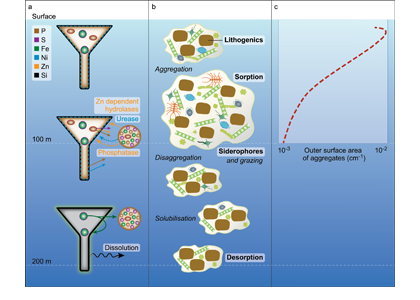 In an admittedly overly simplified summary, the different pools of Fe present in the ocean are defined based on filter pore-size cut-offs and chemical interactions with organic compounds (3). 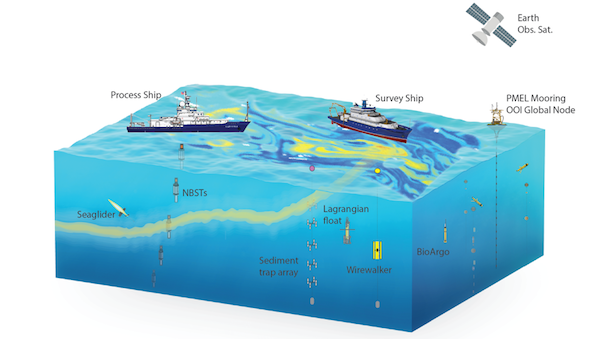 Knowledge of the distribution of these various forms of Fe in the oceans has increased dramatically in recent years thanks to coordinated sampling efforts like GEOTRACES. While the bioavailability of Fe to phytoplankton is believed to be different for the various Fe pools, there is still no clear consensus as to which, if any, pools of Fe are always bioavailable and which, if any, are completely unavailable (8, 9). Additionally, it is known that all phytoplankton are not created equal with respect to their ability to persist under low-Fe conditions (10) and access different Fe pools (9). These factors make it difficult to accurately predict how changing concentrations of the different pools of Fe may impact phytoplankton productivity in a changing ocean. One way to address questions about biological availability is to use phytoplankton themselves as in situ indicators of Fe stress. An approach that appears promising in addressing these questions of bioavailability of Fe to individual phytoplankton species is the development of species-specific molecular markers of Fe limitation such as those that have been developed for the oceanic diatom Thalassiosira oceanica (11), and for the two main groups of the nitrogen-fixing cyanobacterial genus Trichodesmium (12). These assays in particular follow the expression of genes that encode flavodoxin, a non-Fe-containing protein that phytoplankton are known to substitute for the Fe-containing ferrodoxin protein to maintain photosynthetic electron transport under Fe-limiting conditions (13). They focus on gene expression analysis rather than protein analysis, as many phytoplankton have multiple genes that encode for flavodoxin proteins and, at least in diatoms, not all gene copies are sensitive to Fe (14). The Trichodesmium assays were calibrated using cultures grown with six different concentrations of Fe in the media. In laboratory cultivation experiments, gene expression was shown to be inversely proportional to Fe present in the media and expression was downregulated when Fe was fed back to Fe-limited cultures (12). 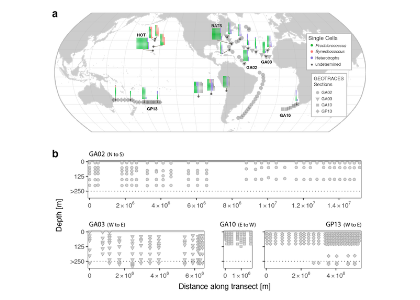 The Trichodesmium thiebautii assay was further used to evaluate field populations from open ocean samples collected globally (15), providing insights into Fe bioavailability to wild populations of Trichodesmium. Overall, there was an inverse correlation between gene expression and total dissolved Fe concentrations (Fig. 1). Comparing the results with the laboratory calibration led to the conclusion that most of the dissolved Fe, including organically bound Fe, was available to T. thiebautii. An intriguing result from this study was that one sample collected in the plume of the Amazon River had significantly higher gene expression than would be expected based on the measured dissolved Fe at that site (Fig. 1; 15). These findings suggest that there is a fraction of the dissolved Fe in the Amazon River plume that is not bioavailable to T. thiebautii, the clade of Trichodesmium that is more abundant and active in the open ocean (15, 16). The T. oceanica assay is also highly sensitive to Fe with high gene expression in cultures that were Fe-limited, a rapid reduction of gene expression following an Fe pulse to Fe-limited cultures, and no induction of expression by macronutrient limitation (11). Using this method on field samples from the northeast Pacific Ocean, T. oceanica flavodoxin expression was found to be highest in samples with low measured dissolve Fe and vice versa (11). 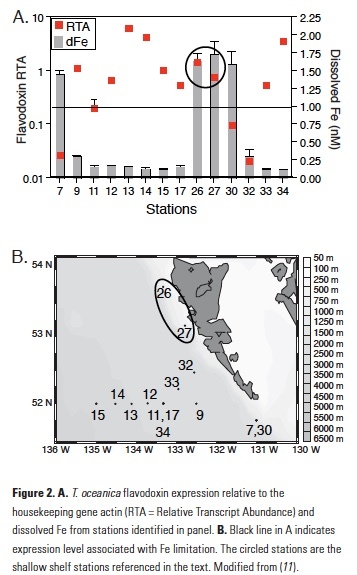 Two notable exceptions to this trend were samples collected along the shallow shelf of Haida Gwaii, stations 26 and 27, which showed anomalously high expression of both genes despite high measured dissolved Fe (Fig. 2), suggesting that something about the dissolved Fe in these shallow coastal stations made it unavailable to the T. oceanica in these waters. It should be noted that T. oceanica is an oceanic diatom species, so both sets of findings suggest that there is a fraction of dissolved Fe from a terrestrially influenced water sample that was not bioavailable to a species of oceanic phytoplankton. While these two datasets are intriguing, they are limited in scope and admittedly raise more questions than they answer. There are a variety of questions that stem from these results, including what, if anything, is different about the dissolved Fe at these stations? Was this coastal/terrestrially sourced Fe unavailable because only oceanic phytoplankton, which rarely encounter dissolved Fe from terrestrial sources, were queried? 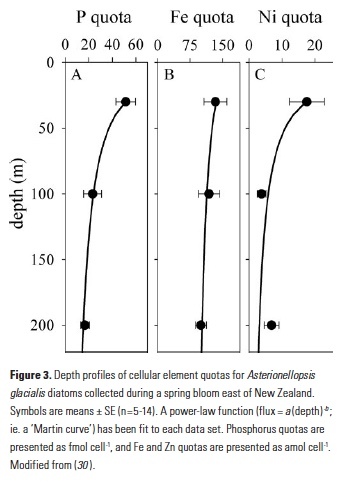 Did coastal phytoplankton simply outcompete the oceanic phytoplankton for access to the dissolved Fe perhaps because they have different or more efficient Fe uptake mechanisms? Would an assay targeting coastal phytoplankton reveal the same results? We know that coastal diatoms have significantly higher Fe requirements (10). What if coastal and oceanic phytoplankton also differ in their abilities to access Fe from different sources? A recent study in the Sea of Okhotsk yielded a significant correlation between a bulk diatom community indicator of Fe stress and dissolved Fe with increasing distance from the mouth of the Amur River, suggesting that the riverine Fe was bioavailable to the community that was dominated by coastal diatoms (17). A number of recent advances in molecular microbial oceanography are making it increasingly possible to start answering these types of questions on a broader scale. A major sequencing effort that was completed in 2014, the Marine Microbial Eukaryote Transcriptome Sequencing Project (MMETSP), added a wealth of data on the functional genetic diversity of marine microeukaryotes (18). The project resulted in over 650 publicly available transcriptomes from over 250 genera of marine microeukaryotes. Even before all the transcriptomes from the project were released, data mining of a limited portion of the MMETSP publically available dataset yielded valuable information as to the varied Fe management strategies utilized by different species of marine diatoms, creating a list of additional potential molecular markers for evaluating Fe nutritional status of diatoms in the field (19). Another data mining technique that has proven useful in identifying coordinated transcriptional responses in diatoms has involved the application of clustering algorithms to evaluate publically available microarray data for two of the more commonly studied diatom species, Phaeodactylum tricornutum and Thalassiosira pseudonana, grown under a wide variety of conditions (20). New insights into the diatom Fe stress response and Fe uptake mechanisms have also been gained through combining physiological experiments with genetic knockdowns of previously uncharacterized Fe responsive genes (21). These new molecular advances are providing a suite of new potential targets for querying the physiological status of phytoplankton present throughout the global ocean. 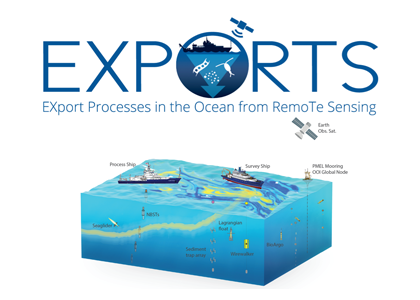 At the OCB/GEOTRACES synthesis workshop on the biogeochemical cycling of trace elements in the ocean, the conversation will include a discussion of how to effectively combine these new analyses with the growing datasets of bioactive trace elements to answer questions regarding the biological availability of different trace element pools. While this mini-review has focused on Fe, additional trace elements will be discussed at the meeting in August. 1. C. B. Field et al., Science 281, 237-240 (1998). 2. J. H. Martin, S. Fitzwater, Nature 331, 341-343 (1988). 3. P. W. Boyd, M. J. Ellwood, Nature Geoscience 3, 675-682 (2010). 4. P. W. Boyd et al., Science 315, 612-617 (2007). 5. F. M. M. Morel, N. M. Price, Science 300, 944-947 (2003). 6. K. W. Bruland, E. L. Rue, G. J. Smith, Limnol. Oceanogr. 46, 1661-1674 (2001). 7. A. L. King, K. N. Buck, K. A. Barbeau, Marine Chem. 128-129, 1-12 (2012). 8. E. Breitbarth et al., Biogeosci. 7, 1075-1097 (2010). 9. Y. Shaked, H. Lis, Frontiers Microbiol. 3 (2012). 10. W. G. Sunda, S. A. Huntsman, Marine Chem. 50, 189-206 (1995). 11. P. D. Chappell et al., ISME Journal 9, 592-602 (2015). 12. P. D. Chappell, E. A. Webb, Envir. Microbiol. 12, 13-27 (2010). 13. J. LaRoche et al., J. Phycol. 31, 520-530 (1995). 14. L. P. Whitney et al., Frontiers Microbiol. 2 (2011). 15. P. D. Chappell et al., ISME Journal 6, 1728-1739 (2012). 16. A. M. Hynes, Massachusetts Institute of Technology (MIT) (2009). 17. K. Suzuki et al., Biogeosci. 11, 2503-2517 (2014). 18. P. J. Keeling et al., Plos Biol. 12 (2014). 19. R. D. Groussman, M. S. Parker, E. V. Armbrust, PloS One 10 (2015). 20. J. Ashworth et al., Marine Genom. 26, 21-28 (2016). 21. J. Morrissey et al., Curr. Biol. 25, 364-371 (2015).